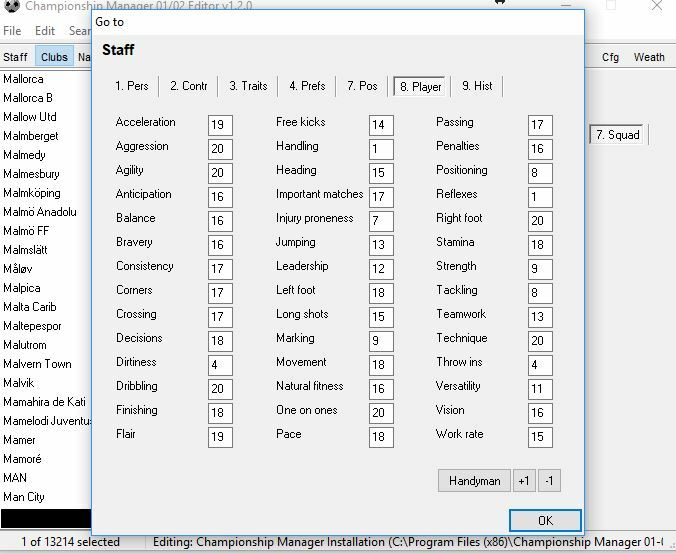 How can I edit player positions? New sign-up to here, thanks so much for the October update! Fantastic work and dedication. I am playing as Bradford, and there are a few player positions that need changing, is there any way I can edit these myself? Load up the editor, make the changes in there and then start a new save and they'll be there. Make sure to run the editor and game as admin. Also, post what should be changed in the England thread so that it can be added for the next update. Thanks so much mate. Sorry for being stupid, but how do I load up the editor? Where will I find this? I'm using the virtual drive, no disc, thanks. Hi Im editing this game for a year, i´m made a historical database, that includes Cruyff in Ajax, Messi, Beckenbauer, Platini, Matthaus, Ibra etc...Today i have a light fall in my house, and pc was without battery and hung up, now i called my editor and this message appears: data load did not find number of configurations in file. my editor is cm 01\02 editor. i need help please it a long time putting my effort on it!! Last edited by conetto1984; 31-10-18 at 04:15 AM. Reason: Wrong Title!! Pack your data folder into a zip file and upload it to sendspace and post the link here, I will try to see if it can be resolved. Is it based on the ODB (original database) ? I need permision from admin to copy it to data paste? I have a backup here from march i copy player config, and nothing!!! I did the system restore and the system only comes back 2 days, so it's alright. I did not lose anything. I'm almost finishing DB, when I finish i will put it in sendspace !! Is there a limit to how many players you can have in a database, or is it simply determined by how much memory space and processing power your computer has? does anyone know of a good save game editor? Thats a good question and I would like to know the answer too, because i want create a random database generator tool and that info would be useful. If I make of a young player's potential ability the same as their current ability, will their stats stay the same until they start to decline towards the end of their career? I'm making a legends database, and I want player stats to stay pretty similar to the ones they are assigned.